Now that Melbourne’s strange run of late autumn 20+ degree days has finished, the weather is settling into a more predictable winter pattern with cooler days and cold nights. As a consequence, I’m back doing the soup thing. 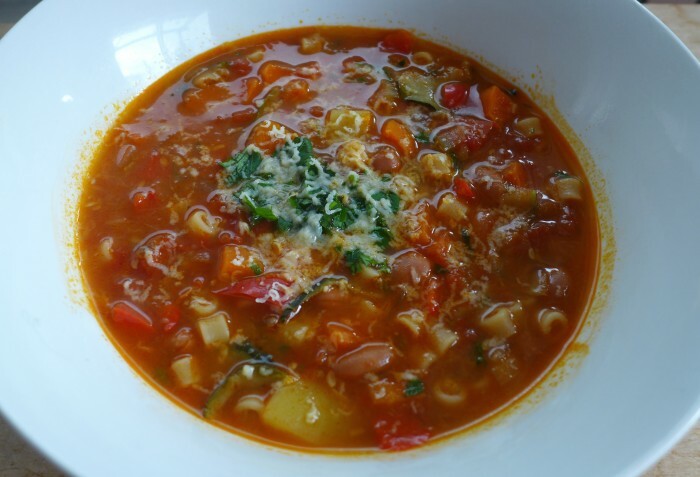 This recipe is for minestrone. I’ve been lucky enough to have some basil survive into winter due to the unseasonably warm May, so I’ve included some in the garnish. A lot of recipes for minestrone that I’ve come across saute some of the vegetables and then boil the tomatoes in with the stock. I’m with them on the veggies being sauteed, but I also like to saute and reduce the tomatoes before continuing on with adding the stock. I think this gives the final soup a lot more flavour. There is no set rule about which ingredients must be used, the only real constants are borlotti beans, tomatoes and pasta. Everything else can be whatever is in season. I even threw in some zucchini I’d dehydrated during the summer glut. I’ve also been continuing my love affair with liquid smoke and have added a little to give just a hint of smokiness. 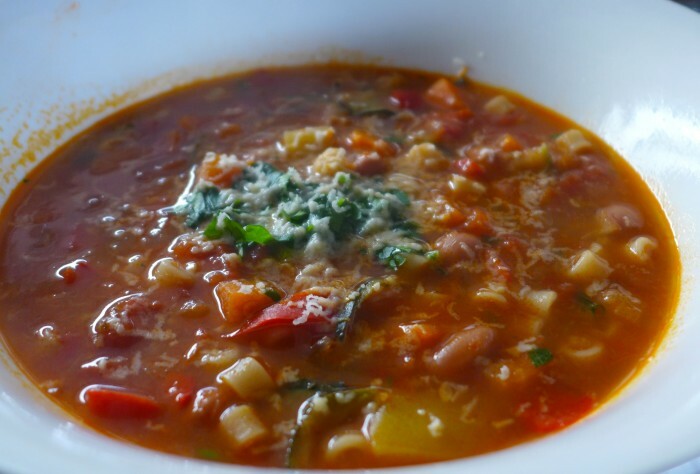 Minestrone often includes leftover parmesan rinds for extra flavour. To mimic this I’ve thrown in a small piece of vegusto piquant cheese, which I think is the closest thing to parmesan I’ve found. This is a great soup for a complete winter meal. It really needs nothing else to accompany it. It is chock full of vegetables and pasta, flavourful, chunky and incredibly satisfying. Definitely ‘snuggle up on the couch’ food. Heat the oil in a large soup pot over a medium heat. Add the diced onion and allow to soften, add the crushed garlic and cook for another 30 secs. Add the tomatoes, bring to the boil and simmer for 15 minutes over a low heat until they reduce and start to stick to the pan. Add the beans, potato, stock/water, parmesan and return to the boil, taste for seasoning and then reduce the heat. Simmer over a low heat until the potatoes are almost done, then add the pasta and the kale. Add the liquid smoke a bit at a time until it is how you like it. Taste it! Serve with the chopped parsley and basil and a grating of vegan parmesan.